We designed and built our home on a site in a small development enfronting wetlands. Rather than extending the ubiquitous domesticated landscape of American suburbia into the native landscape, we instead pulled the wetlands and native landscape back into the domesticated realm of the housing development, weaving our building into it. 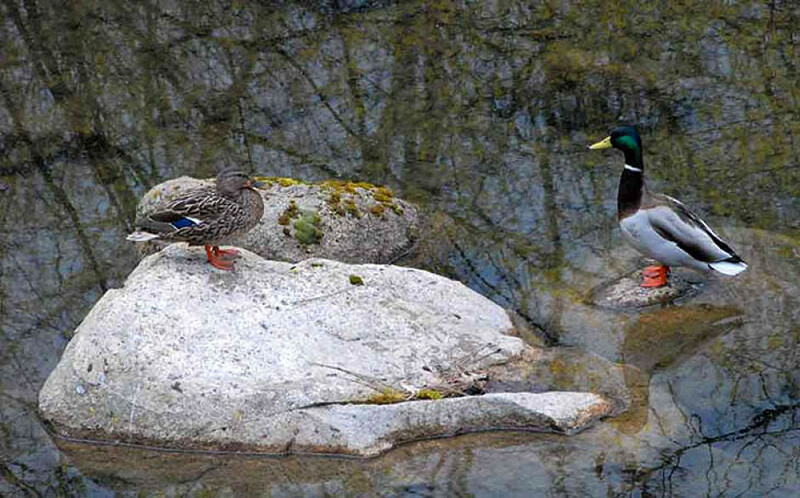 The Mallard couple pictured here takes up residence every March on one of the ponds we built that is filled by a natural regional aquifer. The three images below are views of the nest they built the first year they moved in, less than fifteen feet from our kitchen. These images show the ten eggs just after they were laid, the middle image shows the down blanket mom leaves to insulate and camouflage them in her absence, and on the right is the very well camouflaged mom sitting on the eggs. This is but one of countless cases where we have so intimately experienced the richness of life surrounding us simply because we rejected the normative but extreme measures of claiming the land for 'lawn' and the associated commitment to an endless struggle against the natural forces tirelessly working to reclaim it.